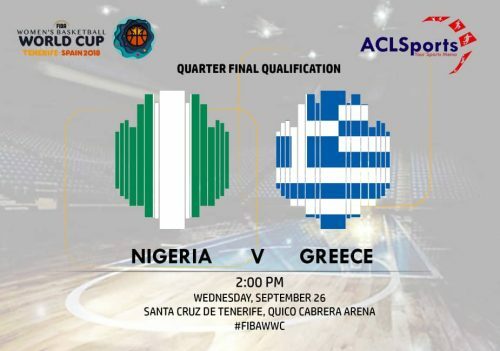 Greece and Nigeria are making their 2nd appearance at the FIBAWWC which make them evenly poised in this meeting at the quarterfinals qualifiers. D’Tigress of Nigeria closed out Argentina to finish runners up in Group B, and Greece could only steal a win against South Korea in group A after falling to Canada and France by big margins. Neither Nigeria nor Greece have ever made it to the knockout round of the FIBA Women’s World Cup so this will be a keenly contested battle between the World number 34 and 20 respectively. The 2004 Athens Olympics is the only meeting between Nigeria and Greece in Women’s basketball. Greece won the preliminary round game 83-68. Team Defense: Nigeria’s biggest strength has been their ability to limit the offensive potency of their opponents in Spain. This is hinged on the quick nifty hands of their guards getting steals and efficient rebounding on both ends of the floor by the Nigerian Bigs. Fast Break: Nigeria is in the top 3 teams in Spain for points made off turnovers. The quickness of their guards, rebounding efficiency and ability to score from the free throw line is the major reason Nigeria has come this far. Maltsi Isolation : The 39 year old shooting guard, Evanthia Maltsi is one of the most efficient scorers in Tenerife, and clearly will be the most efficient player on the floor when Nigeria battle Greece. Coach Konstatinous Keramidas will be looking to her as the pinnacle of their offense. Limit Turnovers: Nigeria will punish any offensive slip up from Greece and clearly, taking care of the ball will be the most important exercise today if Greece want to defeat Nigeria and book the ticket to the quarter finals. Greece: Evina Maltsi, Artemis Spanou, Pinelopi Pavlopoulou.